After the votes of the people in the recent election were counted, the projected Electoral College totals showed that Donald Trump should win the presidency by 306-232. But partisans of the “Never Trump” movement and others can’t bring themselves to accept the Trump victory. They are hard at work trying to persuade Electors to vote for someone other than the GOP’s victorious candidate. Electoral College map for the 2016 United States presidential election (note: Nebraska and Maine split their EVs by congressional district). Image by Gage (2012 Electoral College map) [CC BY-SA 4.0], via Wikimedia Commons. A bit of a refresher course is needed here. The Electoral College system calls on voters nationwide to cast their ballots, not for President, but for a political party’s slate of electors who are pledged to the party’s candidate for president. A citizen’s vote for Trump, Clinton, or any other candidate is actually a vote for the slate pledged to that particular candidate. Whoever wins the popular vote in each state will expect that their party’s slate of electors will choose him or her when the Electoral College meets. According to the system under which the nation has operated from its early years, each state shall have the total number of electors equal to its number of senators (fixed at two per state) and House members (varied according to population). Congress sets the date for the Electoral College to meet and the date chosen for 2016 is December 19th. On that date, electors will meet in state gatherings to confirm the winner of their particular state’s electors. They will duly forward the results of their vote to the President of the Senate. But many of the GOP electors are now receiving fervid pleas to ignore their pledges and vote for someone other than Trump. Should a sufficient number of electors choose to ignore the pledge they made when they agreed to be an elector for their party and its candidate, and their number shrinks Trump’s lead of 306 to below the 270 majority needed for victory, the Constitution (see Amendment 12) calls for the House of Representatives to hold a completely new and remarkably different election. In it, each state would have one vote and only the top three candidates from the November election can be chosen. Each member of the House shall have a vote and the state itself shall have one vote in this unique selection process. Whoever receives a majority of the 50 state votes will become President. A similar procedure would select the vice president but only the top two from the November election would be eligible. Having to rely on this process for choosing a President is unlikely. However, should a sufficient number of electors refuse to honor their pledge to vote for the candidate who was chosen, first in the grueling primaries and then in the general election, they would face an eruption of disillusioned and angry voters. And if the eventual House of Representatives vote for president should choose someone other than Trump, those who voted for him in the general election will feel betrayed by our nation’s governmental system. Anti-Trump activists are determined. Should they succeed in denying Donald Trump his hard-won victory, chaos would surely reign. We can hope that this never previously relied upon process shall not be needed. As she has done in the past, Senator Barbara Boxer (D-Calif.) immediately called for changing the way Presidents are chosen in the wake of Hillary Clinton’s defeat. She abhors the Electoral College method and wants the popular votes of all Americans to determine who is president. A Clinton backer, she laments that Clinton won approximately one million more votes than did Donald Trump. But Trump comfortably exceeded the required 270 Electoral College votes (306 to 232). Cartogram of the electoral vote of the 2016 US presidential election. (Image from Abjiklam (Own work) [CC BY-SA 4.0], via Wikimedia Commons). The California Democrat knows that her proposal will likely go nowhere because it can’t be enacted without an amendment to the Constitution. That is a very unlikely prospect requiring passage in both houses of Congress plus ratification by 38 states. Smaller states will jealously guard the power they have been given with the Electoral College system. Boxer isn’t alone in calling for the change. If her wish had been realized a few years ago, Al Gore would have won the presidency in 2000 and Hillary Clinton would have won in 2016. Each of those defeated candidates won more popular votes but lost the all-important Electoral College vote. Historians tell us that the method of choosing a president resulted from a compromise agreed to by the delegates at the 1787 Constitutional Convention. Understanding why the Electoral College system was chosen has to begin with awareness of the founders’ off-stated abhorrence of democracy and its required majority rule. Also needed for understanding their decision is the fact that it is the states, not the people, who were given the power to choose a president. Then, as now, the smaller states were protected from being overwhelmed by the large-population states. And it should be remembered that the states created the federal government, not the other way around. Alexander Hamilton cited his knowledge of history showing that “ancient democracies in which the people themselves deliberated never possessed one feature of good government. Their very character was tyranny.” John Adams declared. “Democracy never lasts long. It soon wastes, exhausts, and murders itself.” These are the early American leaders who created a Republic and its Federalist system with power remaining in the states, not in the hands of a self-serving majority. Opponents of the Electoral College always claim that it is unfair to deny the winner of the popular vote the presidential prize. But they never note that if the president were elected by popular vote, the candidates would campaign far differently. If the president is to be chosen by popular vote, candidates would spend far more time in what are deemed the “safe” and larger states where either a Democrat or a Republican is expected to win easily. The Electoral College system elevates the importance of so-called swing states, even those that have fewer than ten Electoral College votes. If democracy’s majority rule is the method for choosing a President, there would likely be a remarkably different popular vote total for each candidate. But, without doubt, the candidates would ignore small population states such as New Hampshire and Iowa with their small number of Electoral votes. There’s very little chance that the Boxer proposal will catch fire and be added to the Constitution. The founding fathers were correct and the Electoral College they designed is an excellent way to choose the nation’s leader. It should be left in place. Recent headlines insist that Stephen Bannon, Donald Trump’s choice for a top advisory post, is a hate-filled ogre. Rallies and demonstrations throughout the nation describe him with explosively charged rhetoric. The demonstrators also don’t accept the Trump victory on November 8th while claiming that the President-elect is a racist and sexist hater of gays, Muslims, and immigrants. Image by Sollok29 (Own work) [CC BY-SA 4.0], via Wikimedia Commons. Obama wasn’t in attendance when Wright’s hateful outburst was caught on film. How many other times the left-leaning pastor called on his parishioners to condemn America isn’t known. But the acceptance by his congregation of his strident condemnation of our nation surely indicated that his call for the Almighty to destroy our country wasn’t an out-of-the-ordinary occurrence. When that video surfaced, Obama was just a candidate seeking the Democratic Party’s nomination. He quickly responded in a televised speech in which he sought to separate himself from the angry pastor. But there were no protests or riots because of the denied connection between the candidate and his pastor. Nor did either the mass media report or the protesting minorities make note of Obama’s close relationship with Saul Alinsky, the so-called community organizer who saluted “Lucifer” and taught Marxist political tactics. The mass media would have eagerly pounced on most others for anything remotely equivalent in their background. Then, there’s the numerous unanswered questions about the Obama birth certificate. Yes, Trump eventually accepted it as legitimate and sought to convert the matter to non-issue status. But questions that the media should have asked, but never did, remain. We point out these remarkable inconsistencies, not to insist that Barack Obama was not a “natural born citizen” but to provide more evidence of the mass media’s willingness to overlook important information that might unfavorably impact one of its favorites. Had Donald Trump, or any Republican for that matter, produced a similarly flawed document or been credibly linked in a relationship with an anti-American like Jeremiah Wright, you can bet the angry youngsters clogging the streets and the liberals and leftists who dominate the Fourth Estate would never let such “juicy” information die. Those who protest Trump’s victory and media stars who refuse to ask meaningful questions about Obama’s legitimacy show their bias. But the Trump victory indicates that their hold on the thinking of millions of Americans is slipping away. And that’s very good news. Editor’s Note: The following comes from Accuracy in Media and reveals many activities that are happening behind the scenes of the current protests. As JBS has been saying, these are anything but spontaneous. Media bias won’t let up just because the liberal media were humiliated on November 8. The bias is now being directed at the President-elect’s conservative appointments. Steve Bannon, 2014 photo by DaTechGuyBlog [CC BY 3.0], via Wikimedia Commons. On Monday night’s CBS Evening News, anchor Scott Pelley proclaimed that the Southern Poverty Law Center had declared that Donald J. Trump’s campaign CEO Stephen Bannon “has no business being in the White House.” Bannon was named as chief strategist and counselor. In fact, the Southern Poverty Law Center (SPLC) has no business being cited as a credible source by any responsible news organization. It smears conservatives for profit, diverting attention from real domestic threats, such as the Marxist extremists currently demonstrating against Trump in the streets and threatening to disrupt his inauguration. Many of the demonstrators are from the ANSWER Coalition, an outgrowth of the pro-North Korea Marxist-Leninist Workers World Party. But don’t expect to get any information about the ANSWER Coalition from the SPLC. Even more troubling, SPLC President and CEO Richard Cohen was a member of the “Countering Violent Extremism Working Group” of the Department of Homeland Security in 2010. It is possible that Cohen, in this capacity, was able to get access to classified information, and that the SPLC, in turn, shared its erroneous data on conservative opponents of the Obama administration with federal law enforcement agencies. The attacks on Bannon stem from his leadership of the news site, Breitbart News, a popular source of alternative news and information which was strongly pro-Trump during the campaign. On occasion, the site features some unorthodox conservative views that Bannon’s critics have tried to pin on him. Lazy liberal journalists would rather cite the SPLC as authoritative without having to bother to investigate how the group has been exposed by such investigative reporters on the left as Ken Silverstein. At one time, notes Silverstein, the group did some good work against racist hate groups. But later, in order to expand its business model and make more money, it expanded the “hate” label to mainstream conservative organizations. It has accumulated $300 million in a reserve fund and has become “one of the most profitable charities in the country,” with its top officials getting membership in the so-called financial elite one percent. Donald Trump beat the odds. He beat the Establishment. He beat the culture changers who would have Americans discard their faith and their heritage. And he beat the planners who intend to create a one-world government run by them. Assuming, of course, that he truly is anti-Establishment. Donald Trump speaking at CPAC in Washington D.C. on February 10, 2011 (photo by Gage Skidmore [CC BY-SA 3.0], via Wikimedia Commons). The media stars – television, newspapers, magazines, joined at the hip by multitudes of educators – repeatedly permitted Donald Trump’s enemies to portray him as a hater when Clinton’s carefully chosen rhetoric showed how much of a hater she truly is. Amongst them can be found an array of political elitists, professed liberals, proud one-worlders, professional politicians, and their closely allied pundits, pollsters, prognosticators, and powerbrokers. Almost without exception, these were cheerleaders for Clinton. But they backed the loser. In the recent election, a plurality of Americans relied on their suspicions about their country being steered down a wrong road. So, they resisted further movement toward the cliff looming ahead. They want government to obey the nation’s laws. They want immigration curtailed and illegal border crossing terminated. They want the flow of American jobs overseas stopped. They want to stop the questionable climate change agenda, sovereignty destroying trade pacts, entangling alliances, and endless wars. The Trump victory will likely lead many Americans to revisit numerous other attitudes. We suggest that the same cabal that has misled so many about national and international policies has long used its influence to discount – even smear – The John Birch Society and the many stands it has carefully taken. If he wanted to, Donald Trump could discover that millions of Americans have read a JBS pamphlet or book, heard a Society speaker in person or via the airwaves, even come into contact with a member whose attitudes about the issues made surprisingly good sense. A good question for Americans to ask themselves is simply: If these so-called experts were so wrong about Trump, what else are they wrong about? The United Nations? Lawmaking by executive order? Roe v. Wade? Violations of the U.S. Constitution? Government takeover of medical care? Danger lurking in a drive to hold a Constitutional Convention? And more. The 2016 presidential election should be the pivot when America returned to its praiseworthy roots, when knowledgeable patriotism became reinvigorated, and when the making of America truly great again is more than a slogan. A good place to start is to spread the realization that America originally became great not because of what government did, but because of what government was prevented from doing by the Constitution. We wish the very best for the incoming Trump administration and suggest to fellow Americans that they hold him and Congress accountable. The struggle in Syria has lasted more than five years. Its cost, just to Syria alone, is 500,000 dead and four times that number uprooted from their homes. Many of the displaced have become refugees seeking asylum in Turkey, Eastern Europe, and elsewhere. These refugees have become a serious problem where they have settled – especially in Germany. Azaz, Syria during the Syrian civil war. August 16, 2012, Azaz residents pick up after aerial bombings. (Photo by Voice of America News: Scott Bob report from Azaz, Syria. [Public domain], via Wikimedia Commons). But what is this conflict in Syria all about? It started with the so-called Arab Spring in 2011. That uprising quickly spread throughout the Middle East wreaking its havoc in Egypt until a military coup overturned a Muslim Brotherhood takeover. It led to chaos in Libya and elsewhere enabling forces loyal to Al Qaeda to prevail. In Syria, the Arab Spring emboldened opponents of the government led by Bashar al-Assad. They took up arms and sought to oust him. Soon, the Kurds who populate eastern Syria, northern Iraq, and a portion of southern Turkey had their own reasons for opposing Assad. Long seeking a country of their own, they sent forces against the Assad government with marginal success. Then, out of the spreading chaos, Muslim militants who opposed Assad formed ISIS and seized control of portions of Syria and Iraq. All of this was bad enough but the conflict worsened when Russia and Iran entered the fray on the side of Assad. The rebels seeking to topple Assad began receiving arms and financial aid from the United States and Saudi Arabia. Sunni Muslims who dominate Saudi Arabia and most of the Arab world always opposed any moves by the numerically inferior Shiites who dominate Iran. Yet Assad and his government favor the Shiite rather than the Sunni type of Islam. If you’ve decided this whole conflagration is impossible to figure out, or too confusing to understand, you’re not alone. If you wonder why the U.S. has become involved, you are in a league with millions of fellow Americans. But consider this: The United States supplies arms and air power on the side of the anti-Assad rebels and Russia favors the Assad regime by sending military supplies and engaging in some forms of military intervention. Could the chaos in Syria expand to a greater war outside of Syria? That possibility cannot be ignored. Over the years while this ongoing conflict has continued, U.S. aid to anti-Assad rebels has ended up in the hands of ISIS. Some of the promised aid led to the attack in Benghazi where our nation’s ambassador and three other Americans perished. Other U.S. aid went to Kurdish forces whose loyalty to the U.S. is highly questionable. One policy that few have voiced is that our nation ought to stay out of this mess and similar messes. But those who believe it is America’s duty to create an American-led empire – the neoconservatives in both major political parties – continue to advocate involvement in this costly and seemingly endless struggle. Isn’t it time for America to mind its own business? 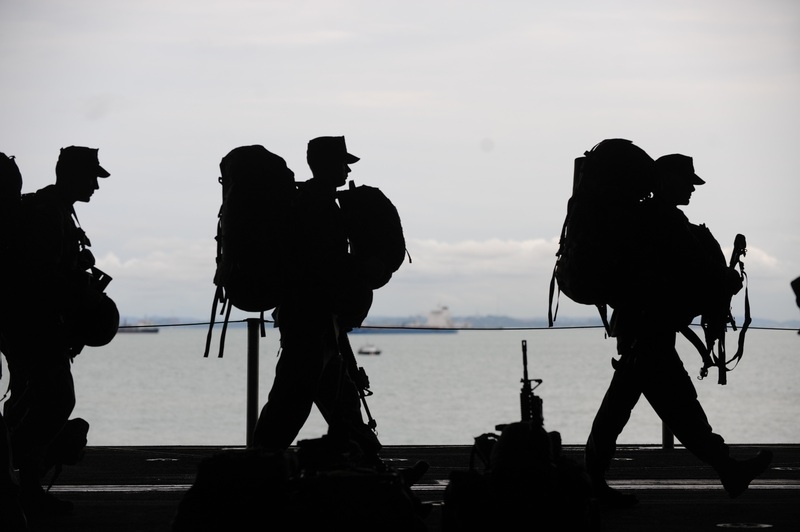 Ten to fifteen years ago, the U.S. military found itself in need of more personnel. In California, an overly ambitious recruiter started giving bonuses and arranging forgiveness of student loans to those who would enlist or extend their time in service. Members of the state’s National Guard, upwards of 2,000 in number, accepted the payments in good faith and stayed in uniform. Many were deployed to Iraq and Afghanistan. CHANGI NAVAL BASE, Singapore (Dec. 12, 2011) Marines serving with the 11th Marine Expeditionary Unit (11th MEU) prepare to depart the amphibious assault ship USS Makin Island (LHD 8) to begin a training exercise. (Photo via Official U.S. Navy Page Flickr by Cpl. Gene Allen Ainsworth III/Released). Approximately ten years later, these individuals began receiving notices telling them the money they had been given was a mistake and they should return it to the government. In 2012, the overly eager master sergeant who doled out the cash and benefits pleaded guilty to approving the more than $15 million handed out to recipients. Our nation’s military, already suffering near exhaustion from more than 15 years of combat in Afghanistan and on the verge of more missions in Iraq and elsewhere, emerged from this mess with a brand new black eye. Former Army Captain Christopher Van Meter received one of the bonuses and then fulfilled his commitment. He even came home with a Purple Heart that he earned in battle. After being notified that he owed the government what he had received, he told a reporter: “I spent years of my life deployed, missed out on birthdays and deaths in the family, got blown up … and now I’m told I haven’t fulfilled my contract.” Others caught in this foul up obviously shared his disgust, even outrage. Some were told to repay as much as $20,000. There have been cases where wages were taken from the paychecks earned in civilian jobs after service commitments had been fulfilled. Some have even been assessed penalties over and above the amount they accepted ten or more years ago. Congressman Duncan Hunter (R-Calif.), a Marine veteran who served in both Iraq and Afghanistan, labeled the repayment demands “disgraceful and insulting.” After complaints by veterans groups and some publicity appearing in the Los Angeles Times, Secretary of Defense Ashton Carter called off the attempts to retrieve the funds. There are now demands coming from veterans groups to have the military reimburse any recipients who may have been frightened into paying back what they had received. The Pentagon plans to set up a team to review each of the cases. Mistakes in the military and elsewhere will always be made and this was an unusual one. Anyone who has served in the military knows that snafus and unnecessary mix-ups will occur. Proper handling of this one is surely called for. And it looks as though the good faith soldiers who accepted the bonuses will get to keep them.